Inexpensive home remedies can often work wonders on cookie sheets with baked-on grease. 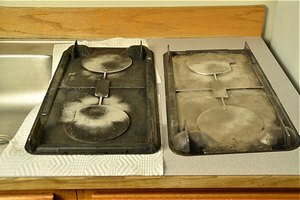 In some cases, you can avoid the problem by cleaning cookie sheets while they’re still warm. Wash the pans with hot, soapy water and rinse thoroughly after using any method to scrub off baked-on messes. If the bottom of a stainless steel cookie sheet is flat and and the sheet has sides, place it across two burners on your stovetop. Pour water into the cookie sheet, add a drop or two of dish detergent and bring the mixture to a gentle boil. Boil the mixture for 5 minutes, turn off the heat and let the liquid cool. 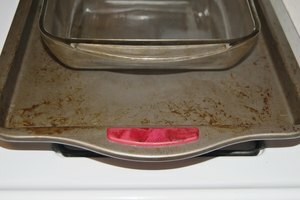 Scrub the pan with a stainless steel scrubbing pad. If the bottom is not flat or the pan doesn’t have sides, sprinkle the pan with baking soda and dampen the baking soda with white vinegar. Let the mixture sit for 5 to 10 minutes, then scrub. To clean an aluminum pan with sides and a smooth bottom, sprinkle cream of tartar onto it. Add water and boil it on the stovetop for five minutes. 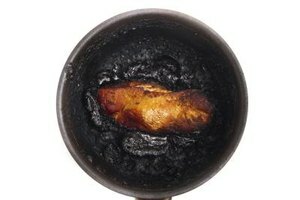 Or make a paste of baking soda and water, and rub it onto the burned grease spots. 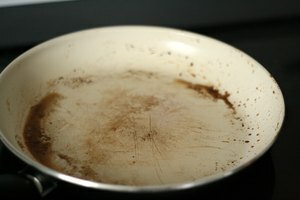 Let the pan sit for five minutes, then scrub. Sprinkle the burnt-on area of a non-stick pan with baking soda, then pour vinegar over the baking soda. Let the mixture sit for 30 minutes, then scrub. 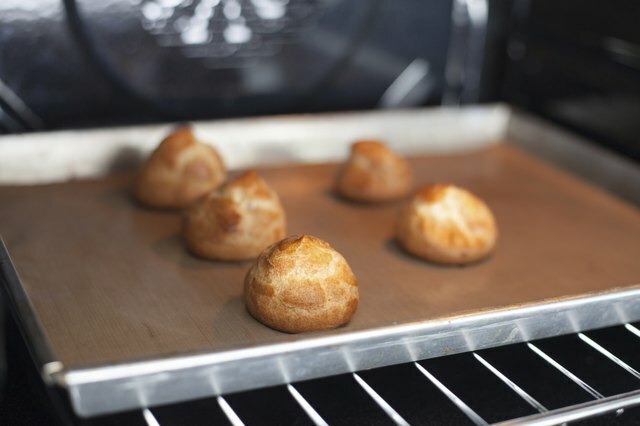 To avoid baked-on messes in the first place, never use grease, non-stick spray or oil on a non-stick baking sheet. These substances bond with the coating and make it very difficult to clean. As a last resort, look for a heavy-duty pre-cleaner in the dish detergent aisle at the supermarket.